At one point in just about everyone’s life there comes a time when one is faced with the task of downsizing and simplifying their living situation. Whether you’re joining the tiny house movement, reducing maintenance requirements by moving into a city condo, or simply no longer needing all that extra space that kids and life filled up, you will have quite a storage task at hand that’s for sure. How does one go about this endeavor? You know you can’t take everything with you, so how does one downsize anyway? First, consider what you absolutely need to live day to day. The key word here is “need” and not want. Items like a bed, sofa, clothes are examples of need. Of these items, how many do you have that are multiples that won’t be necessary in a smaller space? Also, of these items, which could be downsized in just their size alone. Do you need that full sized sectional sofa or could a loveseat work just fine? What about your California king sized mattress? Is that really necessary? Go through your list of needs and start an inventory of stuff that isn’t a need. You can put this list into categories like: sell on Craigslist, donate to Goodwill, place in a self-storage facility, discard using a service or put in the garbage. Now that you have a better idea of what stuff goes where, you can start working through the necessary steps. The first step is to clear the playing field if you will. Self-storage units can help you do this task. Use your inventory list of items to be put in storage to gage how much space you need. Choosing the right sized self-storage unit is key. Don’t be afraid to ask the manager of the storage facility for advice. Use your inventory list to help them help you visualize the space you will need. 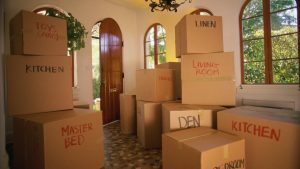 By moving all of these items into a storage space, you will now have room to move through the remaining items in your downsizing project. It will also help you determine if there are extra items that you had originally marked for storage that you actually can just eliminate instead. Anything that you think has value but you’re not taking with you or placing in storage should be sold. There are a multitude of ways to approach this task. A popular avenue is eBay. With the smartphone app, listing and selling on eBay has never been easier! Create an account, snap a photo and list it for sale. Once sold, you’ll have to package up the item and ship to the buyer but eBay has made that a simple process as well with the buyer paying the shipping and you being able to print the label right from home. If online auctions are not your thing, consider using Craigslist to sell the items you aren’t going to place in storage. Think of this site as an online classifieds ad section. You can photograph and list your items for sale, adding a brief description, and then listing options for prospective buyers to contact you. A word of caution though. These are strangers you are speaking with and many email scammers troll the listings to spam you with unsolicited materials. Also, think about meeting the person at a public place such as a Starbucks or other coffee house so that they don’t know where you live nor see that you are moving out with other items just laying around for the taking. Last but not least, why not hold a good old fashioned yard sale? Easy and free, pick a good weekend and post some signs on busy streets guiding people to your location. Don’t have enough stuff yourself? Tell a few friends and make it a yard sale party at your place. People always have stuff to sell and get rid of so the fact that you’re holding a sale makes it that much easier for them. Make sure they price all of their items and put their initials so there isn’t any confusion as the sales start rolling in. 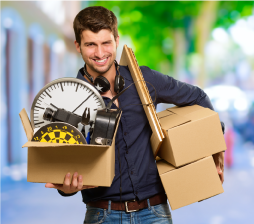 Don’t have time to sell all those items that aren’t going with you or into your storage unit? Donation is a great option to consider. Not only will you be helping the charity with your donations you can take tax deductions for the items you donate. Well known places like Goodwill or St. Vincent de Paul have convenient drop off locations but don’t forget there are many charities in your area. You might take the time to look them up and donate to one that makes a difference in areas that are important to you. The final step in the process is probably my favorite. Discard, trash, throw out, and eliminate anything that is left over. It feels so good to get to this point and simplify your life by removing all of the items that you don’t need, use or will miss once they are gone. If it wasn’t worth storing, selling or donating, then why on earth do you need it anymore? Throw it away and be free of it! You will find the process exhilarating, trust me. Keep in mind the vision of you living your simple, stress and clutter free life and you’ll tear right through this project like nobody’s business.